Teaching Those Who Serve focuses on learning about the unique strategies, practices, and techniques that can be employed while educating military service members and their families. This badge represents focused learning about this learner population, special circumstances which may impact their learning (such as deployments, frequent relocations, post-traumatic stress disorder, etc. ), and specific strategies that can assist learners who serve our country. 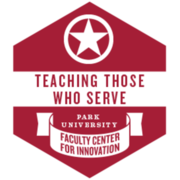 Recipient has learned about and implemented practices for Teaching Those Who Serve to the extent that she/he can influence the learning of others inside or outside the Park University community. He/she has shared their expertise on the topic of Teaching Those Who Serve in one or more Park-sponsored or FCI-sponsored events (such as presenting an FCI Innovation Exchange, creating an FCI “Two-Minute Mentor,” presenting at a Department, School, or College meeting, facilitating a session at the Annual Assessment Institute or a similar University-wide event).